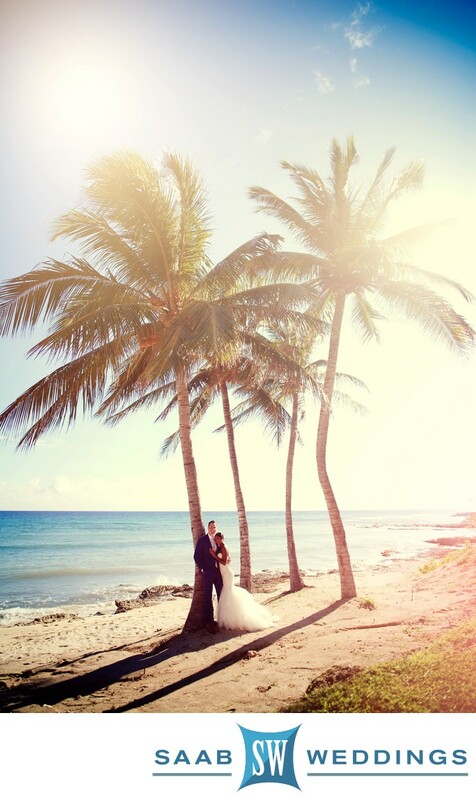 Wedding photo captured at Hyatt Ziva Zilara Rose Hall Montego Bay by Michael Saab shows a bride and groom at a cluster of coconut trees on the beach. This cluster of trees, the sea and beach makes a wonderful backdrop for wedding photos at the Hyatt Ziva Zilara Rose Hall Montego Bay. Knowing how to use natural light is essential for making great images and our many years of experience will make us an exceptional choice to be your wedding photographer at the Hyatt Ziva Zilara Rose Hall Montego Bay.